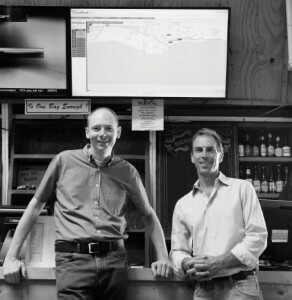 Chris Fowler, left, and Steve Wells are two veteran software executives who founded Santa Barbara-based ClearPathGPS. The service allows owners of commercial vehicle fleets to track drivers, fuel usage, maintenance schedules and more. It’s 2 p.m. Do you know where your delivery trucks are? They could be making runs to customers, or they could be parked at the beach while drivers pad out their time cards. Luckily for firms with vehicle fleets, GPS tracking through cellular data networks can now track their trucks precisely, helping with fuel, maintenance and labor costs. 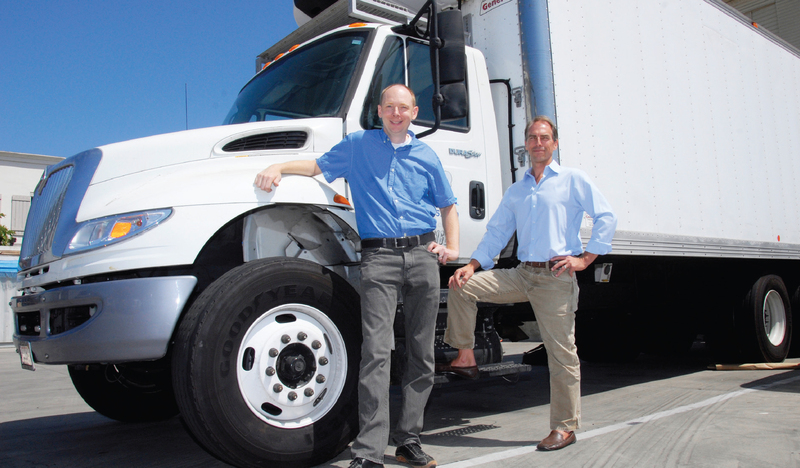 Two Santa Barbara software veterans have started ClearPathGPS to make that technology affordable and easy to use for fleets as small as five vehicles. Steve Wells and Chris Fowler have known each other since their days at Software.com and have worked at some of the biggest and fastest-growing tech firms in the area, including Citrix Online, Sonos and RightScale. Wells had also worked in GPS fleet tracking for nearly a decade. With ClearPathGPS, the pair have set out the goal of blending the latest hard ware with Web-hosted software run in the cloud and a local, in-person touch. In a happy tri-county coincidence, ClearPath GPS uses hardware built by CalAmp Corp. in Oxnard. But the rest of the system was built from the ground-up. Fowler created clever ways to compress the massive amounts of data that come from tracking truck positions every 30 seconds. The entire system can be updated wirelessly and the code is hosted in the cloud, meaning that once hardware is installed, the owners of a vehicle fleet never have to do more than log on or open a mobile app. “We really saw an opportunity to provide local GPS tracking in the Tri-Counties,” said Steve Wells, right, co-founder along with Chris Fowler of Santa Barbara-based fleet-tracking service ClearPathGPS. That leads to low costs: $250 to install hardware in each vehicle, and then $20 per month thereafter. And users can quit any time or put vehicles on “hold” if they’re not in use. “If you can save five gallons of gas in a month, this thing pays for itself right away,” Wells said. And the best way to save gas is to prevent speeding. Simply knowing that somebody is watching often does the trick. Erick Crocker is the owner of Santa Barbara Ice & Propane. He uses ClearPathGPS and keeps a map of where his trucks are displayed on a huge screen at company headquarters. The system generated some immediate revelations, Crocker said, such as a two-and-a-half hour delivery route that suddenly only took an hour once it was tracked. And of course, there was speeding. “We ran a report on who was going over 70 mph, and it was 91 pages long,” Crocker said. Fowler had heard the request and built the feature. “Our goal is happy customers,” Fowler said. Aside from speed and location, the tracking devices can show when a vehicle is turned on or off. Crocker said that he’d taken a truck in for maintenance and something didn’t feel right after picking it up. It turned out that the truck hadn’t been turned on for three days, proof that the garage hadn’t done the work. The gear helps Crocker know if trucks are idling for long periods, which is is prohibited by California law and clogs expensive soot filters. And tracking driving patterns can help reduce the number of engine rebuilds or brake jobs needed. “You would never believe how useful it can be to know how your trucks are being driven in terms of mechanical problems,” Crocker said. Wells and Fowler said there’s plenty of business to keep them busy in the Tri-Counties and that the face-to-face appeal of ClearPathGPS means they won’t personally try to expand it to other areas. But the software system itself can be scaled up to any size needed with the help of cloud computing for ClearPathGPS to operate in other markets.